View More In Performance Parts & Accessories. Our World-famous Wideband O2 air/fuel ratio UEGO gauge features a digital LED display and sweeping LED 'needle' that changes colors as AFR changes from rich to lean. A 52mm (2-1/16") gauge housing ensures that it will fit in most gauge pods and can be remotely mounted virtually anywhere. 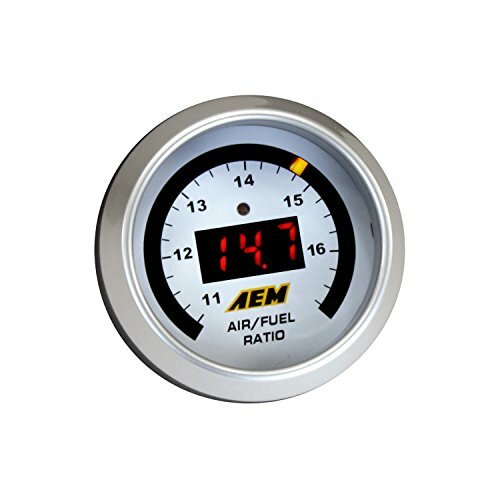 All AEM digital gauges feature a 0-5V analog output for use with data loggers and almost any engine management system. Each gauge comes with black and silver bezels and black and white faceplates for multiple color combinations and a custom look (a black Lambda faceplate and black and white Air/Fuel Ratio faceplates). The Bosch UEGO sensor gives the controller its speed and accuracy. The Bosch 4.9 LSU sensor used in the AEM Wideband UEGO AFR Controller Gauge has a faster light off time and draws less current than the 4.2 LSU sensor used with AEM's 30-4100 Wideband UEGO Controller Gauge, which will be superseded to the gauge in August, 2014. The 4.9 LSU sensor features the same fuel compatibility as the 4.2 LSU and NEVER requires free-air calibration when used with AEM's Wideband UEGO AFR Gauge. The 4.9 LSU sensor uses a different connector than the connector used with the 4.2 LSU sensors included with the original 30-4100 gauge controller. The sensors are not interchangeable between the two gauge controllers in any way, including changing connectors on the gauges. The Wideband O2 air/fuel ratio UEGO gauge is a must if you want to maximize your engine's power and safety. When tuning an engine, accurate air/fuel ratio data is critical because running with too rich of an AFR can cause a loss of power, and running a lean AFR can result in serious engine damage. AEM's digital Wideband AFR UEGO gauge can quickly alert you to even a .1 change in air/fuel ratio and provide enough time to shut down an engine before damage occurs.